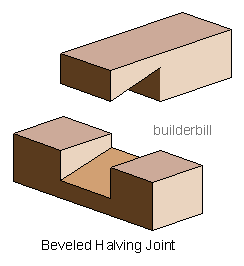 A half lap joint where two pieces are lapped over each other. Can be Corner Lap, "T" lap or Cross Lapped. 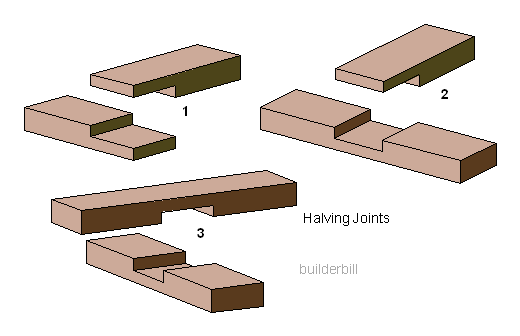 In the sketch above you can see a few examples of this simple joint that can be made easily with basic hand tools. These joints where used for framing the carcasses in cupboard and wardrobe construction before cheap panel products like MDF came on the scene. A corner half lap joint. At the right is a beveled joint. Note! The bevel is a touch extreme here. I should be something like 1:6 ratio. 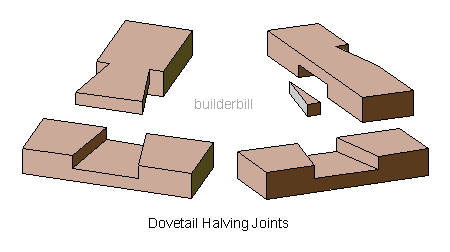 Below are two versions of dovetailed halving joints. One of them has a wedge to firm up the joint.